Having recently completed a successful UK tour supporting Futures, last weekend Manchester's Pegasus Bridge announced they will be splitting up later this year. However before calling it a day, the quartet will be releasing a new double a-side single and playing several shows throughout the summer before a final farewell in their hometown in September. Bassist Alex Howick recently caught up with Alter The Press to discuss the split, the new single, their recent tour with Futures and more. Alter The Press: You've recently finished a UK tour with Futures. How was it? Alex Howick: The Futures tour was incredibly humbling; we were able to go to places, many which we’d never been to before, yet there were people singing along every single night. Birmingham and Manchester were especially crazy. It was a great bill to be a part of. ATP: Off the back of that tour, last weekend you announced you were splitting up. How did the decision come about? AH: Over the past few months, some really huge offers have come our way. Whilst most of us were excited by this, it pushed some to the realisation that this wasn’t what they wanted. It was a realisation which was crushing for all involved and left us with no alternative. This should have been the start but it turned out to be the end. However, my best friends are in this band and the last thing I want is for any of them to be unhappy. ATP: From reading your statement, it looks like the band had a difference of opinions in terms of its future. Is that correct? AH: As I have said, some wanted to pursue a very different life to the one we have been living. Some of us didn’t. It’s a real shame. ATP: Before calling it quits you will be playing numerous summer shows before finishing off with a farewell show in Manchester. What can we expect from these shows, especially the final show in September? AH: They will be very emotional, especially the Manchester date. We’ll be playing some songs we haven’t had in the set for a while, but also some of the new material which we had been working on for the next record. Unfortunately, for many of the songs, it’ll be the only chance fans will get to hear them. The songs really pushed us musically and developed our sound into something we were very proud of. We just wish you could hear them on record. ATP: In addition you're planning a final A-side single. What can you tell us about this? AH: We have played them at a few shows and they always go down brilliantly, so we are hoping that they will be a nice farewell present for fans of the band. The tracks were recorded by Ant West from Futures, who also did the Brother record. It gives a great indication to the direction which we were heading in. 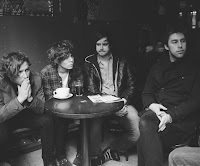 ATP: What plans do the members of Pegasus Bridge have planned for the future? AH: It’s far too early for any of us to undertake new projects. This is still our priority until September. ATP: How will you remember your time with Pegasus Bridge? AH: A surreal, fast-paced adventure with some of the greatest people I’ve ever met. ATP: Any final words to close the interview? AH: Thank you so much to everyone who gave us a chance to live out our dream for the past two years. When we announced the split and saw that PB was trending worldwide, you all absolutely stunned us. We didn’t know that so many of you cared. Come to one of the final shows and celebrate with us. You’re all ace. Pegasus Bridge's final show will take place on September 17th at Sound Control in Manchester.